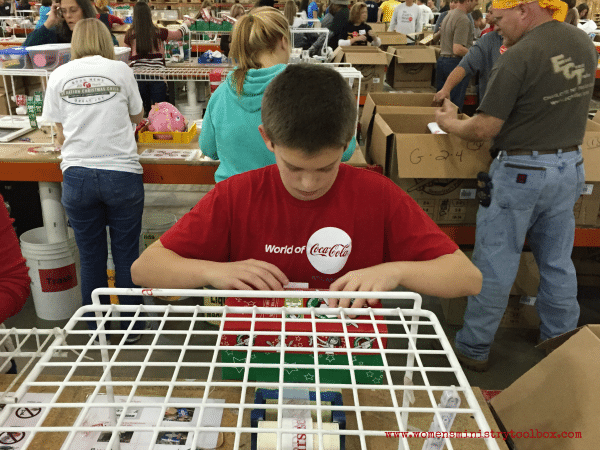 For more than 10 years our family has packaged boxes for Operation Christmas Child (OCC). Ove the years we’ve packed boxes for boys and girls of every age group. When our boys were younger we would pack boxes for boys the same ages as ours. This year we packed several boxes with an intentional message. 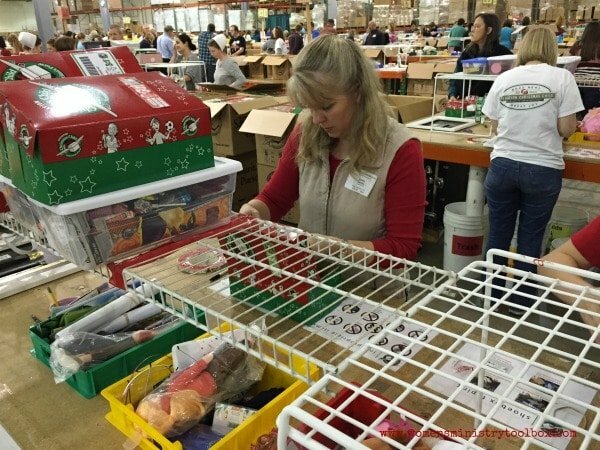 While I’ve had a passion and a heart for the OCC ministry for years, much like the Grinch, my heart grew three sizes this year during our time serving in the OCC Processing Center in Charlotte. I’ve been struggling for the last week and a half to put our experience into words. I’m hoping some of the pictures I share will help convey the impact it had on all our hearts. Our shift was scheduled for five hours – 5 PM – 10 PM on a Friday night. We tagged along with a group from my sister’s church. Once our entire group had arrived we went through a brief, but thorough, training session. Our training leader shared the piece of an amazing shoe box story. 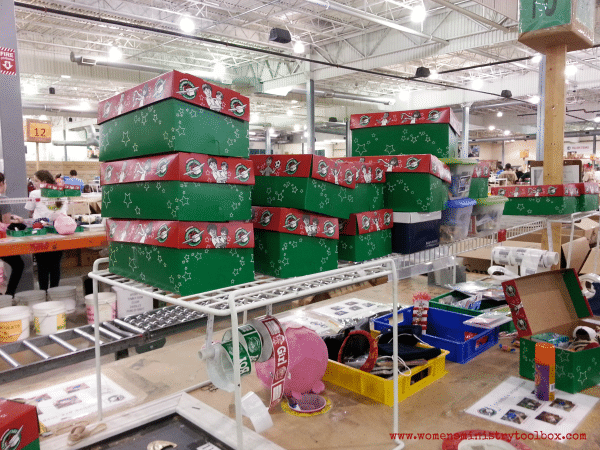 I won’t do it justice, but I’ll try… A family had felt led to pack red scarves in three OCC boxes they were sending. They faithfully prayed for the girls that would receive those scarves. In ways in which only God can work, the three girls who received those scarves were eventually adopted by that very same family. Once we were placed in our stations out on the floor (18 green) Cynthia our OCC coordinator for our shift had us each chose a task. 1. Finances – One person checked each box for shipping donations, removed them, and placed them into a box. 3. Tape Dispenser – Secured each box with a piece of tape. Passed the boxes to the packing crew. 4. 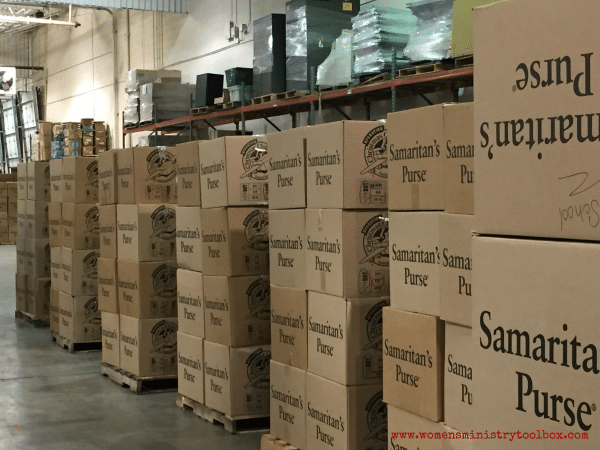 Packers – Placed at least 14 OCC boxes in each case for shipping. 5. Scanners – Scanned those boxes that were being tracked so senders could be notified of which country their box was sent to. My husband was the Finance guy. Our younger son took on duties at the tape dispenser. While I took on the role as inspector. Unfortunately our oldest was home sick. As you can see our warehouse looked a bit like Santa’s workshop might. There were hundreds for volunteers working our same shift all inspecting, taping, packing, and scanning along with us. In case you’re curious, all of the items we had to remove from boxes are collected. Food and liquids were the two things I had to dispose of most frequently. While I felt awful removing items others had so thoughtfully selected, liquids could spill and ruin not just that box but the boxes for other children. 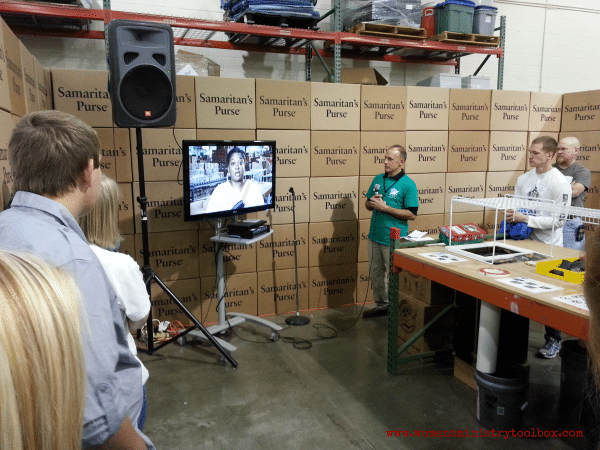 In just one day our distribution center processed well over 140,000 OCC boxes for shipping to Honduras. The folks at OCC are organized and efficient. They have it down to a science. I was moved beyond words to get a peek at the many letters and photos that accompanied so many boxes. And I was completely convicted to include our photo and address in every single box we send from now on. 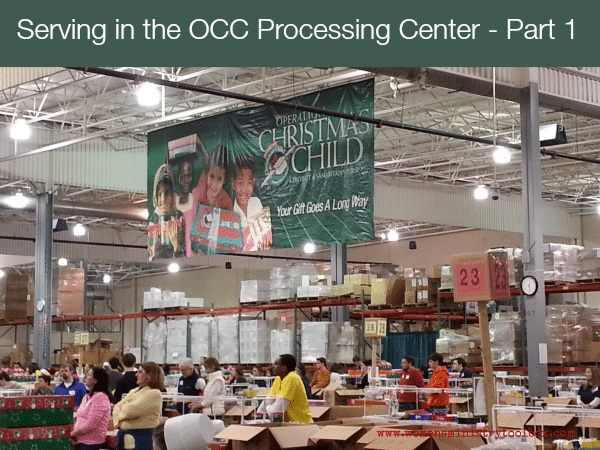 Click here to read Part 2 of our time at the OCC Processing Center. And wait until you see the surprise God had in store for me!